This manuscript shows the note values as well as the pitch. Did early Medieval music show the note values? To learn more about Renaissance music, visit the Early Music Glossary. Can you list three definitions that help you understand Renaissance music? Listen to Greensleeves, a song that may have been written by King Henry VIII of England. This is probably the most famous tune ever written from the Renaissance. 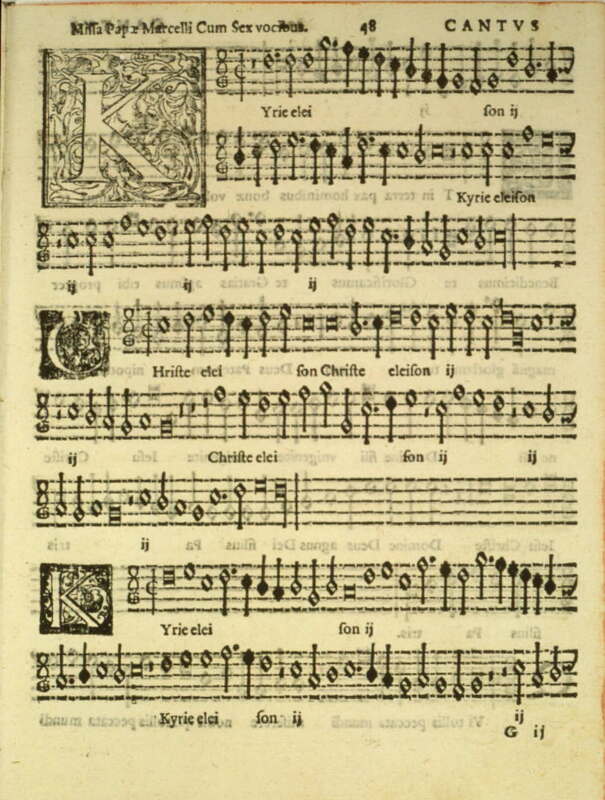 A page from Giovanni Palestrina's Second Book of Masses, 1567. [Online Image] Available http://www.ibiblio.org/expo/vatican.exhibit/exhibit/e-music/Music_room2.html, December 19, 2001. Renaissance means rebirth. This period saw a rebirth in knowledge. The Renaissance was turning from God to man. Science and the arts were becoming more important. Christopher Columbus discovered America and Michelangelo was painting the Sistine Chapel. William Shakespeare was writing his famous plays. Secular music is non-religious music and it was becoming more popular during this time. There was a rise in instrumental music and dance music, too. The printing press was invented during the Renaissance. Some people consider the printing press to be the most important contribution to civilization in the last one thousand years! The printing press allowed music to be printed quickly. Before the Renaissance, music had to be copied by hand. 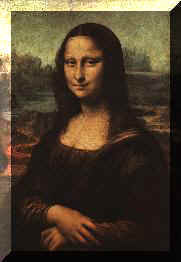 One of the most famous persons from the Renaissance was Leonardo da Vinci. He was known as a Renaissance man because he could do many things well. He was a painter, architect, inventor, scientist, poet, musician, and teacher. This was the golden age of the a capella style. That means that choirs sang without instruments. Vocal music was still more important than instrumental music. Madrigals were popular during the Renaissance. These song forms were performed in groups of groups of four, five, or six singers. A madrigal is secular music. This is non-religious music. Madrigals were usually love songs. Listen to Hey Ho, Greenwood, a madrigal by the English composer William Byrd. This is a polyphonic work, which means it has many musical lines of equal importance. This piece is sung with lots of imitation, which means the voices take turns singing the same melody. Religious music was still very important. Choral music of the Renaissance was an extension of the Gregoriuan chant. It was sung a capella and sung in Latin. Motets were popular during this time. A motet is a polyphonic work with four or five voice parts singing one religious text. June 13, 2002. Some people consider him the father of modern harmony. Giovanni Palestrina was one the the Renaissance period's most important composers. He was Italian. He wrote mostly religious works. He is considered one of the great masters of Renaissance music. He wrote motets, madrigals, and masses. To hear some of Palestrina's music, click here. Kyrie Kyrie means God. This is the first piece in a musical mass. Gloria Gloria means Glory and follows the Kyrie. Credo Credo means Creed of Belief. It follows the Gloria. Agnus Dei Agnus Dei means Lamb of God. Here are three popular song forms of the Renaissance. This is a polyphonic work, which means it has many musical lines of equal importance. Madrigals were sung with lots of imitation, which means the voices take turns singing the same melody. Madrigals were performed in groups of four, five, or six singers. They sang secular music. This is non-religious music. Madrigals were usually love songs. A motet is a polyphonic work with four or five voice parts singing one religious text. They are similar to madrigals, but with an important difference: motets are religious works, while motets are usually love songs. A musical mass is like a motet, only longer. It also follows the religious service of the Catholic Church and is sung in a very specific order: Kyrie, Gloaria, Credo, Sanctus, Benedictus, and Agnus Dei. It is performed in Latin. Most of the music of the Renaissance was polyphonic, but something new was being heard. What was it? Read on. Texture is the way melody and harmony go together. All music has texture. The three musical textures are monophonic, polyphonic, and homophonic. A melody all by itself would be monophonic. It would have no harmony. Gregorian chants are monophonic. This type of music was popular during the Medieval period. Polyphonic music is when two or more voices of equal importance are heard at the same time. The texture of most Renaissance music was polyphonic. Later on homophonic music began to appear. This means the music started to move in chords. Composers began to blend sounds because they were interested in how notes fit together. They wanted all the parts of their music to move in the same rhythm. This is also called chordal music. There was a growth in instrumental music, especially the lute and keyboard. The most popular instrument of the Renaissance was the lute. 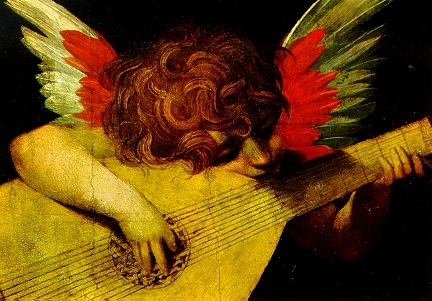 Angel with Lute, c. 1522 [Online Image] Available http://www.nmhu.edu/departments/english/homepages/shanna/ren.htm, December 20, 2001. Listen to a lute duet. It was during this period that families of instruments started to develop. These families were called consorts. This is where we get the word concert. To see and hear a Renaissance consort, click here. Can you identify the instrument in this picture? If you guessed the violin, you'd be right. What was it called during the Renaissance? Can you identify some other instruments of the Renaissance? For some help, click here. Visit The Internet Renaissance Band website to hear more instrumental music of the Renaissance. Dancing was a favorite pastime during the Renaissance. Educated people were expected to know how to dance. There were simple dances that were usually danced in chains or circles. There were also more difficult dances that required lots of practice. Dancing encouraged new forms of instrumental compositions. Many songs were written just for dancing. To learn more about these instruments, click here. Branle In this quick French dance the performers swing from side to side. It's preformed in a circle or a chain. Pavane This was a slow processional dance in an even meter where couples would walk in pairs. See the picture below. Galliard This dance follows the pavane. It's in an odd meter and is lively and complicated. It can also be danced in couples. Allemande This is a simple dance in an even meter that can be danced in a group moving forward or backward. Canary This is a complex dance for couples. It comes from Spain the started in the Canary Islands. Here is a couple dancing the pavane. Their bulky clothes made it difficult for them to move quickly. To learn more about Renaissance dances, click here. To hear more Renaissance music, click here. To learn more about Renaissance music, visit the Early Music Glossary. 1. In a canon, all voices repeat the same melody. Can you name any canons you have sung? What else are canons called? 2. A Renaissance man is someone who is good at everything he tries. What would you need to do today to be a Renaissance person? Is there anyone living today you would consider a Renaissance person? Why would it be harder to be Renaissance person today than during the Renaissance? 3. How did the printing press change music history? 4. Shakespeare invented many words and phrases we use today. Some are bump, eventful, lonely, assassination, fair play, and catch cold. Can you quote any famous lines from a Shakespeare play? 5. Name some important ways that the Renaissance is different from the Medieval period. 6. How do clothes affect the way people dance? Do you think the way we dress changes our behavior? 7. Why do you think the Medieval period lasted 700 years longer than the Renaissance? 8. What is the musical texture of most of today's music?